Why are we always trying to educate the public about hybrids and why you shouldn’t buy them from breeders? Because we’re constantly getting phone calls and emails about so many in need of rescue. It’s truly heartbreaking. When they begin having behavioral or medical problems, owners try to surrender them. Domestic shelters often can’t take them. And we’re one of the few sanctuaries in the country that try to. These cats are caught between 2 worlds. Though they’re wild cats bred with domestic cats, breeders claim they’re “domestic.” Yet they boast about their wild ancestry when they sell them – sometimes for thousands of dollars. 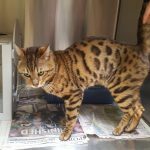 Bengie is approximately a 2-year-old Bengal who was picked up as a stray and sent to a local impound. From there, a rescue group took him into their program. But after displaying some aggressive behavior, they reached out to see if TWS could possibly provide a home for him. Saving little wild cats is as important as saving big wild cats. And it can often be just as expensive since they come to us with so many issues. Bengie’s here now and will be assessed by our staff, as well as receive an intake exam. 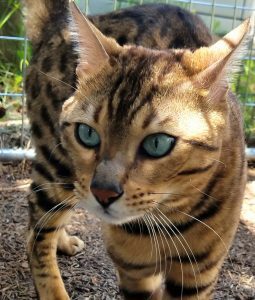 We hope that, by providing indoor and outdoor areas and a lot of stimulation Bengal cats need, we’ll be able to decrease or eliminate any aggressive behaviors. If you’d like to become his sponsor parent, that would mean so much for this little one. Find out how to do that HERE.